So far Britt MacDonald has created 1 blog entries. Before being selected for our program last year, Ember Sherwood applied for a Habitat home three times. She worked extremely hard over the past five years to clean up her credit so that she could meet our selection criteria. Ember currently lives in her parents’ home, sharing a small bedroom with her 1-year-old son Grayson and 8-year old daughter Ava. They can’t use the adjoining bathroom due to rust coming from old pipes, and the windows are infested with mold. They have no privacy and the children have no place to play. Medical professionals have advised Ember that her one-year-old son Grayson’s asthma is aggravated by the mold in their current home and that his digestive disorders (gastroesophageal reflux disease and swallowing problems) could improve in a less stressful environment. Both children will benefit from having more space to play: inside the house, in their new home’s small yard, and in the small park that will be located in the development. Once removed from substandard living conditions and moved into their safe, decent home, it is anticipated that Ember’s children will thrive. It’s been a long-time goal of Ember’s for her family to have place of their own. She is extremely motivated to prove to her children that if you work hard enough, you can accomplish anything. 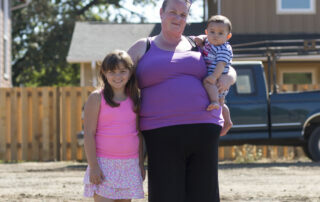 In addition to being a great role model for Ava and Grayson, Ember is an inspiration to the families with whom she works at Yamhill County Head Start.